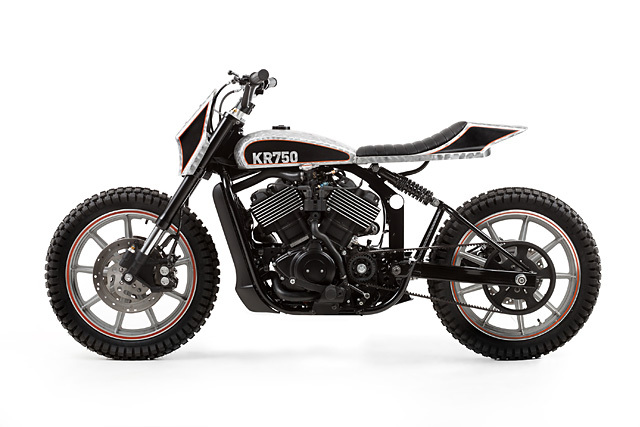 The first thing to hit you upside the head is the engine turned tins that immediately give the bike some real dirt track cred. 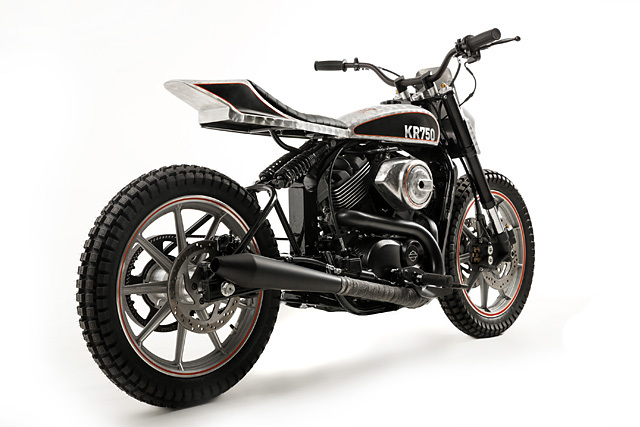 The tank is made by VM Production team in Japan, while the replica XR750 seat made by Red Max Speed Shop in the UK was narrowed by KK before being mounted to a new custom subframe. 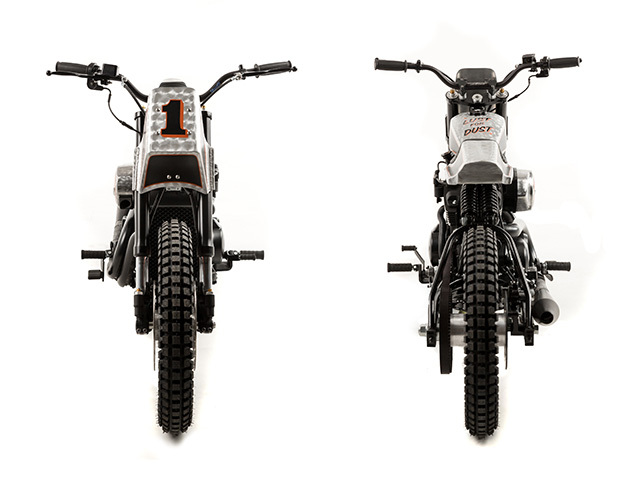 The race plate is in fact a heavily modified tracker seat that now houses all the electrics for an ultra-clean, stripped down, race bike feel. The tuck and roll saddle is the work of Mile Style, while the incredible artwork is done by the brilliant Karl Stehn of KDS Designs. 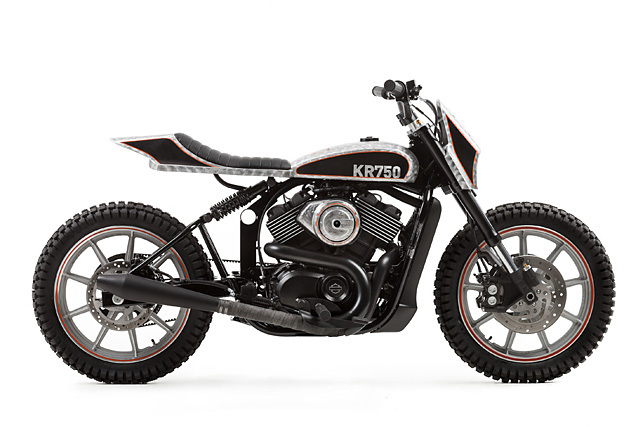 The KK crew never built this bike to be a static display; it’s built for the dirt and will be raced hard so taking care of the handling was a high priority. The front end is from a Yamaha R6, with the standard Street stem pressed into the R6 trees and requiring an in-house machined spacer to fit. The top tree was then machined to allow for risers to hold the obligatory tracker bars. 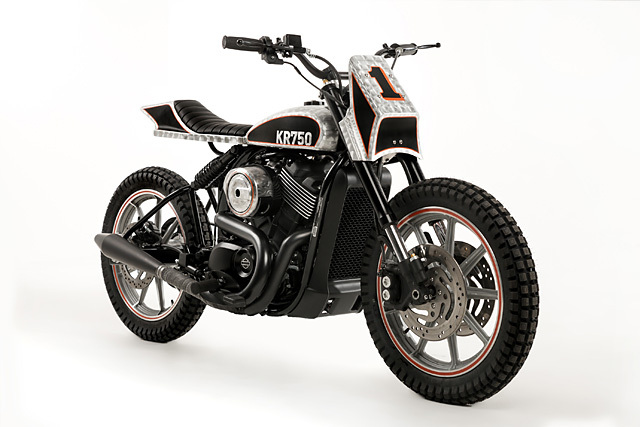 The rims are XR1000 front wheels fitted to both ends of the bike, but you can’t just bolt old Harley wheels to a modern Yamaha USD setup. The front axle is machined to fit the XR wheels, while KK’s own aluminium spacers allow for the twin disc front. Further fettling then allows for the HD discs to work in unison with the R6 calipers, leaving a front end with perfect form and function. If the front end is impressive the rear requires more than a double take to appreciate the workmanship that was employed in such a short period of time. Harking back to another classic of days gone by is the twin shock cantilever suspension that dare I say it is even better than that once sported by the iconic Vincent Black Shadow. Utilising the standard Street swingarm the KK crew then fabricated the full cantilever setup that allows for twin Burley Slammer shocks to swing from the frame. 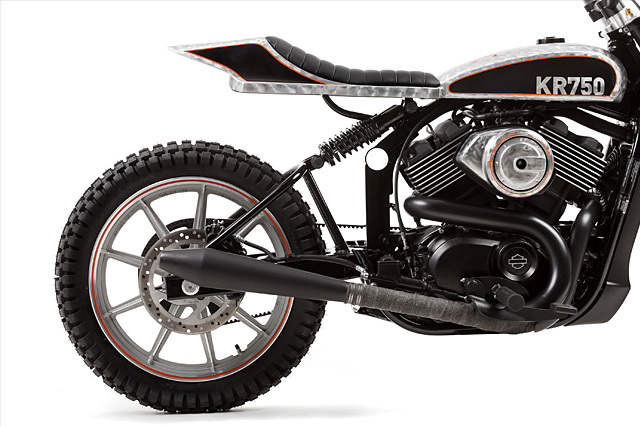 Not only is it an impressive piece of engineering it also narrows the bike in true tracker fashion and balances the proportions of the slim rear rim. You can’t build a dirt racer and then fit a set of street tires so bolted on are Shinko Trail Pro 110/80/19 tires front and back. Taking weight out of the bike was further helped by stripping the entire loom and removing all lights and unused sensor. While an external high flow fuel pump is neatly mounted in tail section. 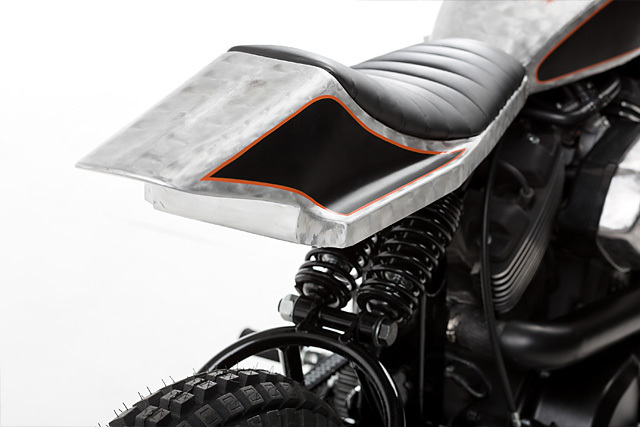 Cracking the throttle is a 1/4 turn setup and the bark comes from a custom rear pipe that hangs off the factory street headers. 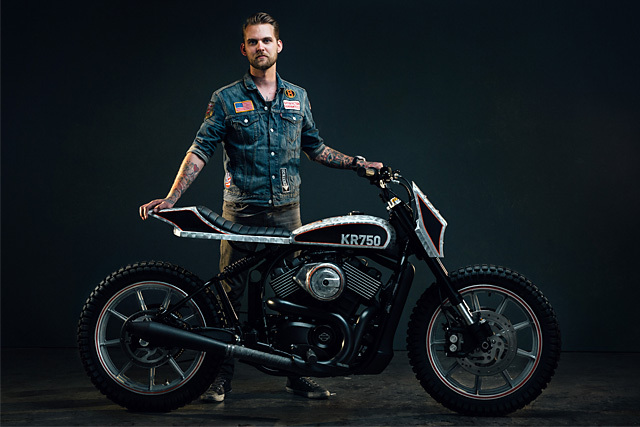 With the bike completed in time for its first showing at the end of 2014, Kustom Kommune now have their eyes set on taking the first custom Street 750 to the track to show just what the standard Harley-Davidson Revolution XTM V-Twin Engine can do. 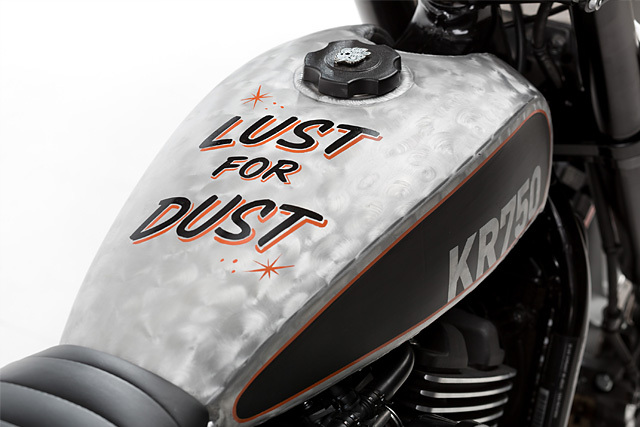 With a wildly talented in house crew pulling off an incredible build for one of motorcycling’s most iconic brands, 2015 means the pressure is off and the throttle can be held wide open, it’s time for KR750 to let the dust fly!